When the New York Giants traded linebacker Olivier Vernon to the Cleveland Browns for guard Kevin Zeitler, the Giants and Browns swapped mid-round picks, with the Giants sending a 4th-round (132nd overall, acquired from Saints for cornerback Eli Apple) selection for the Browns’ 5th-round (155th overall) selection. As part of the wide receiver Odell Beckham trade to Cleveland, both teams now retain their mid-round picks. In fact, both trades were actually processed by the NFL as one deal. The net effect was that the Browns received Beckham and Vernon in exchange for Zeitler, Peppers, a 1st-round pick, and a 3rd-round pick. 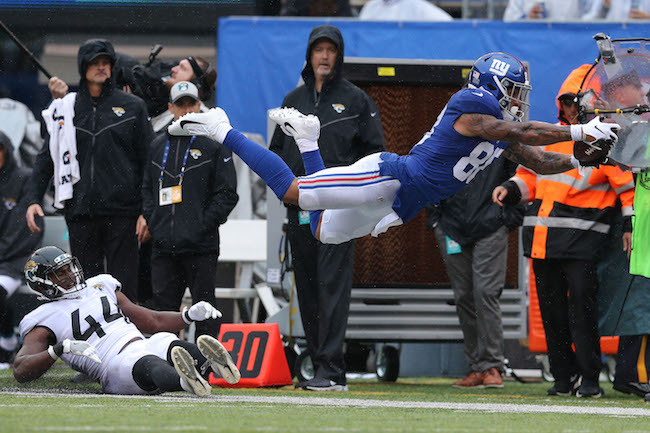 “The New York Football Giants would like to thank Odell Beckham, Jr. for his contributions,” said General Manager Dave Gettleman. “We truly wish him well in Cleveland, and we want to wish (Olivier Vernon) the best and nothing but success for both of them. “With the first-round draft choice, that gives us six and 17. As we continue to build this team, you need draft pick capital. This trade enabled us to do that… You can win while you build a roster. We do have a plan, and this is a part of it. “We’re very excited we were able to get a quality NFL guard in Kevin Zeitler. We’ve already had him in here, and he passed his physical. That really adds another piece to the offensive line repair that we have going. Now, we have most of the line under control for the next couple years. It’s a great opportunity for us to build stability on our offensive line. We’re excited about that. The New York Giants have traded linebacker Olivier Vernon to the Cleveland Browns for offensive guard Kevin Zeitler. 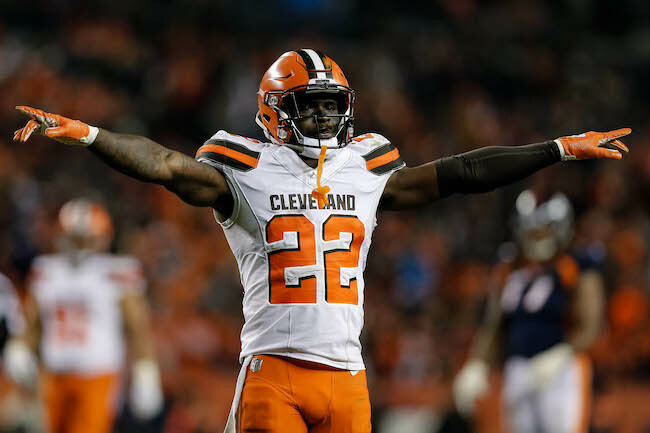 In addition, the Giants and Browns swapped mid-round picks, with the Giants sending a 4th-round (132nd overall) selection for the Browns’ 5th-round (155th overall) selection. Vernon was scheduled to earn $15.25 million in salary in both 2019 and 2020, and count $19.5 million against the 2019 NFL salary cap. 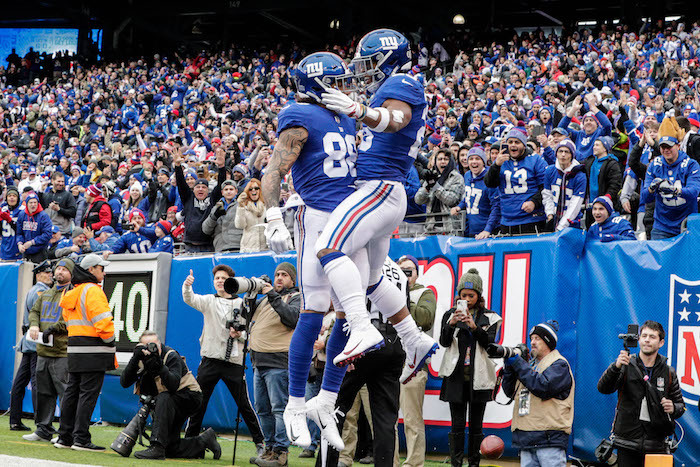 The trade will reportedly net the Giants $1.5 million in 2019 salary cap room as trading Vernon “saved” the Giants $11.5 million while the team now takes on Zeitler’s $10 million 2019 salary. Overall, the Giants absorbed $8 million in dead money from Vernon by trading him. The 29-year old, 6’4”, 315-pound Zeitler was originally drafted in the 1st round of the 2012 NFL Draft by the Cincinnati Bengals. He signed a 5-year, $60 million contract with the Browns in March 2017, which at the time made him the highest-paid guard in the NFL. In seven seasons, Zeitler has started 103 of the 104 regular-season games he has played in, not missing a start in the last four seasons. Zeitler has good size and is a consistently solid run and pass blocker. 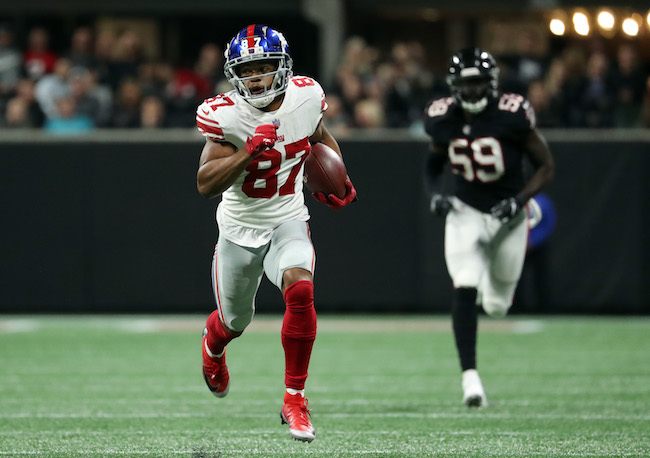 Vernon’s first three seasons with the Giants were sabotaged due to nagging injuries, including a high ankle sprain in 2018 that caused him to miss the first five games of the season. Vernon started the remaining 11 games, accruing 30 tackles, 7 sacks, 1 pass defense, and 1 forced fumble. Despite the missed time and subpar tackle production, Vernon played in the Pro Bowl as a first alternate. Vernon was originally drafted in the 3rd round of the 2012 NFL Draft by the Dolphins. The Giants signed him as a free agent in March 2016 to a 5-year, $85 million contract. Although Vernon played in all 16 regular-season games in 2016, a serious left hand/wrist injury affected his play. In 2017, he missed four games with an ankle injury that also continued to be a factor in other games. 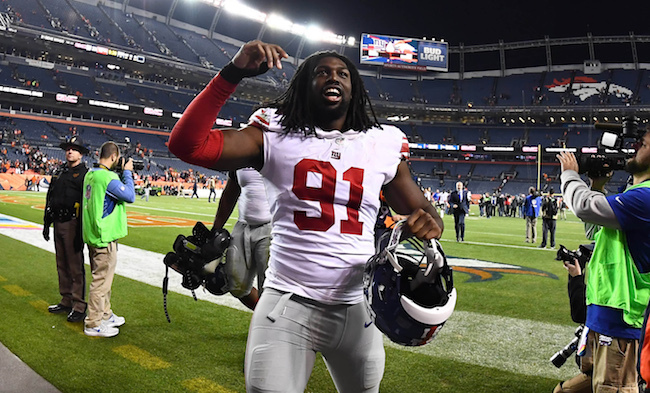 An undersized but athletic defensive end, the Giants shifted him to linebacker in 2018 to fit their new 3-4 scheme. The New York Giants have re-signed exclusive rights free agent center Jon Halapio, who won the starting center job in 2018, but was lost early when he was placed on Injured Reserve in September 2018 after breaking his ankle and lower leg in the second game of the season. The injuries required surgery. Halapio was originally drafted in the 6th round of the 2014 NFL Draft by the New England Patriots. He has bounced around different leagues and teams including the Patriots (2014), Boston Brawlers (2014), Denver Broncos (2014–2015), Arizona Cardinals (2015), Brooklyn Bolts (2015), and Patriots (2016) again. The Giants signed Halapio to their Practice Squad in 2016 and 2017. The Giants then added him to the 53-man roster in October 2017 and he played in 10 games, starting the last six at right guard. Opening Remarks: I just visited with the team, and so they’re going through their exit process. I think the important thing is we’ve talked about how one year can connect to the other and we made some progress as a team. I mentioned yesterday this is about leadership and team building. We’ve made some progress. We certainly didn’t reach any of our goals in terms of being in the playoffs and competing for the championship, but we’re a different team than this team was a year ago and it’s a credit to the players. They’ve been very coachable, they’ve done what we’ve asked – staying in the moment, continuing to fight, and every game matters, every play matters. I think we’ve made progress there. Now, right is right, we’ve got to get better in all areas and that’s the process that we’re going to begin. I have no answers for you about any player moving forward. I know Dave (Gettleman) is going to have a chance to visit with you. I’m probably going to visit with you less this time of year. This is about player acquisition, player evaluation and things that quite frankly we’re not going to be willing to share. I think that’s something we should keep private and move forward with. The players are finishing up their evaluations, I’m going to get a chance to meet with a lot of them individually. The way we did it, we had a team meeting, right now they’re meeting as an offense and a defense, then they’ll meet with their position coaches, and there will be a select few I visit with before they leave. Then anybody I don’t talk to, I certainly will be able to talk with on the phone. I appreciate all the hard work that you guys have done. I understand reporting on what we do is not easy. I’ve tried this year to be very open and honest and share with you things that are appropriate to be shared, and so hopefully we can keep that going. With that said, I will take your questions. Q: How do you go about deciding who are the players, the select few that you said you meet with? What goes into that? A: I just have a list, and that’s private. But I visit with the players all the time anyways, so along the way here the last couple of weeks with some of the rookies, I could do a drive-by on them and say, hey listen, you did this well, this well, this well, make sure you’ve got a plan this offseason. Part of what is going to be very important for our rookies is between now and when we come back in 15 weeks, and this is the first time in their lives where they’ve had to manage their offseason. If this thing’s about setting standards and putting habits in place, we’re going to help them make sure that they do the right things. Q: You said you’re proud of the team and how it has grown. Have you thought about your own growth from when you first took this job to now, and what can you tell us about that? A: I don’t know. I quality control myself all the time, I want to make sure I’m sharing a message that is the New York Football Giants message, and I think that’s important. I start everyday trying to do the things only I can do for this organization, and then help in areas where I have expertise. I constantly go through that. I try to grow every day as a person, and hopefully that rubs off on the job. Q: What do you think went well or not as well this year when you look back? A: We didn’t win enough games. What we did well is we took a young team and a new team and a new staff and we competed, and we had some good victories. But we’ve got to do a better job of winning those close games. We’ve either got to get a stop or get a score, and that’s where we need to get better. Q: When you say self-evaluate, how about yourself in terms of some of the things you look back at? A: Being I’m the play caller, there’s always a handful of plays. You make 70 decisions in 40 seconds or 25 seconds or less, as you all have watched, you’re not perfect. So what you try to do is become more perfect, make less mistakes, make more good decisions. Q: When you look at the close games that you lost, are there things that you think you could do to help win those? A: Yeah, I think each game, there’s a different story in each game. But like I said, in a close game, you’ve either got to get a stop or you’ve got to get a score. In the games that we’ve lost, we haven’t done those things. So those are the things you look at. Maybe there’s things we could do different tactically, we’ll look at that, that’s always part of it, the scheme evaluation. That’s what we spend our time on, at least half of each day is spent on that. Q: When you look back from when you got hired until now, you obviously know a lot more about the organization, the players, everything. Looking back, was this more of a rebuild than even you thought it was? You talked a lot about distancing yourself from 3-13. A: I don’t know what I expected from that standpoint. When you take these jobs, you really don’t know much about anything in the building other than the history and the tradition and some of the players, the ownership and the people in positions of authority. But having not worked with them, as coaches, we get a feel for players and people after we work with them. So I certainly have a much better view of what this organization is and I can help more or have more educated ideas as to what we can do moving forward because I know the players, and now I have a staff of guys that I’ve worked with. I mentioned it this week that other than Bill McGovern, I did not work with any of these coaches. I purposely didn’t hire some of my friends who are now no longer my friends, but I’m really pleased. And again, we can all grow, there’s things that we can all do better, but I’ve got a bunch of guys here that I’m looking forward to moving forward with. Q: You will keep the staff intact? A: Yeah. Again, you can’t ever say that. Some guys leave for whatever reasons, but again that’s part of the process that we’ll go through. We’ll meet as coaches and try to find ways to get better. Q: What’s your policy if another team wants to interview one of your guys? Would you let them? A: Individual basis. In terms of, I’m all for guys advancing, I really don’t want to stand in anyone’s way and I’ll have some opinions as to whether it’s advancement or not. But, listen, I had ambition as a young coach, you gain experience and want to move forward. I don’t want to stand in anyone’s way. I think as long as I replace that guy with a career coach that’s open-minded, understands the importance of relationships and can work together with the staff, we’ll make it work. Q: If you look around the NFL, coaches seem to be on a short leash. Does that increase your sense of urgency to get things right? A: I don’t know that. I think I’m pretty urgent, and I’m pretty disappointed when we don’t win every week. No, I don’t think so. I think we all understand the environment. Did I hear there’s eight guys that lost their jobs already? That’s a fourth of the league, and that’s pretty typical. I guess we all understand how that works. Q: You always talk about blocking out the noise. Is today one of those days where you can’t ignore what’s going on around the league? A: We don’t have an opponent to prepare for, so I’m certainly aware more of what’s going on. There’s no reason to block anything out today. Q: You said you didn’t know anything about the organization really. What do you know now after a year here? A: Very supportive. Really, there’s a lot of people in this building that have worked here a long time that live and breathe and sleep everything that we do well, and share the pain when we don’t win. We have a committed organization, we have a committed group of players, and it’s up to us now – as I’ve said, right is right. We’ve got to start winning these close games. Q: What do you want Saquon to come back to you in April as? A: A better version of his former self. I think that’s important. That was part of the message I already mentioned to the players, is making sure that they keep moving forward. All year, it’s been about team and tough and together, and that really doesn’t stop when the guys leave the building. Q: How would you describe how your relationship with Odell has been over the year? How has it progressed up until now? A: It’s good. 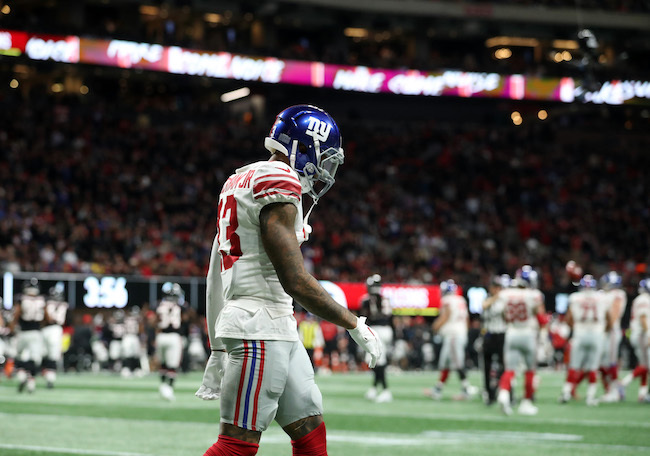 I appreciate everything that Odell has done, I appreciate him as a player, I appreciate the fact that he’s tried to get back here in the last month. Unfortunately, he wasn’t able to do that. Just like any player on our team, I’ve learned a lot about Odell and I think our relationship is good. It’s very honest and open, just like it is with every other player. Q: Did Kyle (Lauletta) develop as you thought he would when you picked him in the fourth round? A: I don’t know what I expected. Again, I think Kyle has a bright future, but there’s a lot to learn, especially at the quarterback position, to be able to function efficiently at this level. I think he’s made great progress. He’s one of those guys that he needs to continue to improve and work on the things necessary to do his job here in the next 15 weeks. Q: When you sit down with Dave Gettleman, how much input do you have in conversations about your own free agents like Landon Collins and Jamon Brown and those guys, and free agents maybe across the league you’d be interested in? How does that dynamic between you guys play out? A: It’s very open. As you might expect, we talk all the time about all the players. Dave is well aware of what I think of the players, I’m well aware of what he thinks, and we’re both well aware of how those players are going to fit moving forward. I don’t think any of us are looking for a percentage of impact on decision making, but it’s very open and honest what we think about players. Q: Do you have guys who are going to need surgeries here or injuries you’re going to be watching? A: A couple guys moving forward, but nothing super major. I don’t know if you had somebody specific. I don’t have all that information yet. I do know the ones that are probably going to need a little touch-up, I guess you’d say. I don’t have any details as to when that’s going to start. A: Did you have somebody in mind? Q: Is Odell one of them? A: No. He doesn’t need surgery. Q: How about Landon? What’s his situation with the injury and rehab? His timetable? A: He had a labral tear on his shoulder, so it’s going to be a length recovery, three or four months, I guess. But he’s been around, I’ve had a chance to communicate with him throughout, so he’s fixed and he’s now coming back from his surgery. Q: Does Saquon need anything? Q: Eli is going to be 38 this week. The quarterback situation moving forward is going to be a topic I’m sure you guys discuss over the next few months. How do you look back and look at the full 16 games and view how that went specifically for Eli? A: I think it’s all coordinated. 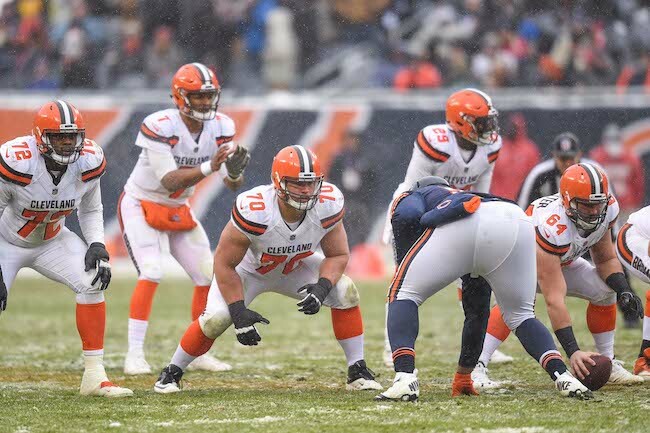 The quarterback play, the line play, the ability to run the ball – I think what we want to be offensively was better showcased from the bye week on. Prior to the bye week, we were scoring 17, 18 points a game, and after the bye week we’ve scored 27, almost 28 points a game. That’s what you need to do. Part of that was we solidified the offensive line, which allowed Eli to do more of what Eli can do better, and helped our runner. I think we would all agree in the second half of the year, we played much better offense. So when you talk about a coordinated effort, I talked all along about the things I really appreciate about Eli in terms of playing the quarterback position. They’re like everybody else, they make mistakes. Andrew Luck threw a pick-six last night. When you’re making the decisions and you’ve got the ball in your hand every play, there’s mistakes that are made, but there’s also some great things that you’re doing. We’ll go back and look at it all, but I think he was better able to showcase what he could do once we solidified the offensive line. I think that’s a fair assessment. Q: Was there a quarter or handful of drives at some point in the season where you looked at it and said, that’s it, that’s what we point to? A: I don’t know, I think there’s always stretches of games, key moments throughout. I can’t say I would point to one or another. Q: A lot of these young QBs in the league are going crazy with numbers and things like that. Is your philosophy of quarterback, Eli is not that, never really was that. Do you look at the quarterback and say, I want a guy who can win the game, manage the game, scores 28, 27 points a game and isn’t have to be a 50-touchdown kind of guy running around and things like that? A: When you look around the league and let’s assume there are good coaches everywhere, you try to play to the strengths of the guys on the roster. The Baltimore Ravens are playing a different style of offense now that Joe Flacco is not their quarterback. I guess what you do is try to maximize and that’s what I was saying about the last eight weeks. You try to maximize the skillsets of the players that you have. It’s a coordinated effort – nobody can do this alone. Baseball is the ultimate skill sport, this is the ultimate team sport, and nobody can carry the team by themselves. It’s a coordinated effort. As much as everyone would like to say, Saquon did all these things, and he did a lot of great things, well, we blocked better and it was coordinated with the throwing game where he maybe got some two-shell runs. It’s coordinated. Q: Is this version of the offense you played in the second half of the year, is that compensation or is that because of limitations? Or is this what you want your offense to look like? A: I like offense where you’re able to run the ball throughout because play action is meaningful. Again, I think Eli ran more boots and nakeds, he hasn’t run this many boots and nakeds since he was at Ole Miss. But it works, and we changed the launch point. I think we’ve given up 40-some sacks. Since the bye, I think we’ve been sacked like 15 or 16 times, so again, it’s coordinated. I want an offense that’s going to score enough points to win. The last two weeks, we didn’t do that by a point. Q: Both Dave and John (Mara) said that the offensive line was their number one priority for last offseason. Do you now feel at the end of this season this could be your offensive line going forward? Or does it need more tweaks? A: No, I think you’ve got to always address the offensive line to some degree. I think sometimes the answers are on your roster. (Jon Halapio) came in and played really well at center until he got hurt, then we picked up Spencer Pulley who’s done a very, very good job playing center. (John) Greco stepped in and played center, we picked up Jamon Brown. I think you’ve got to always try to upgrade your offensive line to some degree because when you look around and you start to see teams that are playing bad offense, don’t look at the skill players first. If you can’t block them, then nothing fancy looks good, nothing normal looks good, nothing that you need to do in football looks good if you can’t block them. I think that’s where this game starts. I worked for Nick Saban, and I watch Alabama. Alabama’s got a lot of very talented players, but when push comes to shove, the teams playing Alabama can’t block them. You may make a play or score a touchdown, but when you’re trying to do it over and over and over, teams can’t block those guys. It’s important that we’re always addressing the fronts. This is a big man’s game, and we’ve got to make sure we’re doing what we can to get the O and the D-line right. Q: Obviously Eli has won here. When he has done so, it has been with a good pass rush on the other side and a defense that has helped him – most quarterbacks have. Do you think you have a winning offense as constituted or close to it if your defense can make stops at the end and put more pressure on opposing offenses? A: I think we’ll have a winning team when at the end of the game we can either stop the team or score against the team we’re playing, and again that’s part of being coordinated. We’re going to address all those things moving forward. Q: We asked you about (DC) James Bettcher last week. Before the season started, one of the big storylines was how he would work with you and (OC) Mike Shula. What does he (Shula) bring to the table and how did that dynamic work with you calling plays? A: I have a great deal of respect for Mike and having worked with him now, it worked great because along the way, we’re on the headset talking. He works with the staff, I think he’s done an outstanding job and he’s part of the reason for some of the success, at least offensively, we’ve had in the latter part of the season. I look forward to having him here moving forward. Q: How is that? You say he’s part of the success, we don’t see that. What is it about him? A: He’s smart. He was calling plays in the Super Bowl for Carolina. We work together. He’s a career coach, he works extremely hard, he’s smart, and we communicate well together. He does a good job with our offensive staff, and on game day, I get great suggestions as to what to call. There’s a lot of times when I’ll say, hey listen, I want to call apple or orange, what do you think? And he’ll say call orange. That’s the communication that happens. Again, you don’t get a chance to see it, but I certainly appreciate his efforts. The New York Giants will have the 6th overall selection in the 2019 NFL Draft. Although not officially announced, the New York Giants have reportedly signed defensive end Jake Ceresna and long snapper Taybor Pepper to reserve/futures contracts. The 24-year old, 6’6”, 295-pound Ceresna spent the past two years in the Canadian Football League (CFL) after a brief stint with the New York Jets in 2016. The 24-year old, 6’4”, 245-pound Pepper went undrafted in 2016. He signed with the Green Bay Packers in 2017, playing in four games, before being placed on Injured Reserve with a broken foot. The Giants finished 2-6 at home, 1-5 vs. NFC East opponents, and 0-3 in division home games. This is the first time they lost all of their home games within the NFC East since 2003. According to the Elias Sports Bureau, they are the first team in NFL history to lose each of their final two games by one point. The Giants lost eight games by seven points or less, the most such games by any NFL team this season. The Giants lost all five games in 2018 when quarterback Eli Manning passed for 300 yards or more. The Giants are 19-31 in Manning’s 50 career 300-yard regular-season games. Manning passed for 4,299 yards this season, the fourth-highest total of his 15-year career and the seventh time he exceeded 4,000 yards. Manning completed a career-high 66 percent of his passes (380 of 576). His previous best was 63.1 percent in 2014. Manning threw 21 touchdown passes, the 12th time in his career that he has thrown at least 20. Manning’s 11 interceptions were his fewest since he threw he threw 10 in 2008. 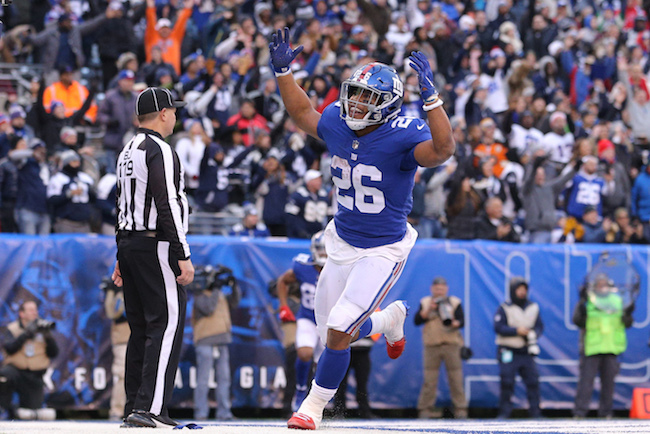 Running back Saquon Barkley finished with 261 rushing attempts for 1,307 yards and 11 touchdowns, and 91 catches for 721 yards and four scores. His 11 rushing touchdowns are a Giants rookie record. He had been tied at 10 with Bill Paschal, who set the mark in 1943. Barkley is the first running back to lead the Giants in catches since Tiki Barber did with 69 in 2003, and the first player to lead the team in rushing and receiving in the same season since Barber in 2003 (1,216 rushing yards, 69 catches). Barkley’s 1,307 rushing yards is the seventh-highest total in Giants history. Barkley’s 1,307 yards are 477 more than the No. 2 rookie on the franchise’s list – Tuffy Leemans’ previous record of 830 yards, set in 1936. Barkley’s 91 receptions are a record for an NFL rookie running back. The former record of 88 was set by New Orleans’ Reggie Bush in 2006. The 91 catches ties wide receiver Odell Beckham’s Giants rookie record. Barkley had 2,028 yards from scrimmage. He is the third rookie in NFL history with 2,000 yards from scrimmage after running backs Eric Dickerson (1983) and Edgerrin James (1999). Place kicker Aldrick Rosas made 32 of 33 attempts this season, a Giants-record 97 percent. Barkley and left guard Will Hernandez started all 16 games. This is just the second time since the 1970 merger that the Giants had multiple rookies start every game. In 1981, linebacker Lawrence Taylor and defensive tackle Bill Neill started every game. New York Giants General Manager Dave Gettleman addresses the media on Wednesday. Wide receiver Odell Beckham (quad) did not practice on Friday. He has been ruled out of the game against the Tennessee Titans on Sunday. Left tackle Nate Solder (abdomen) practiced on a limited basis, but he is expected to play on Sunday. Tight end Rhett Ellison (ankle) and safety Curtis Riley (wrist) fully practiced. Both are expected to play. There is no media availability to the New York Giants on Saturday. The team plays the Tennessee Titans at MetLife Stadium on Sunday. Wide receiver Jawill Davis (concussion), offensive tackle Chad Wheeler (ankle), and linebacker Alec Ogletree (hamstring) fully practiced on Friday. The Giants on Saturday in preparation for Monday night’s road game against the San Francisco 49ers. 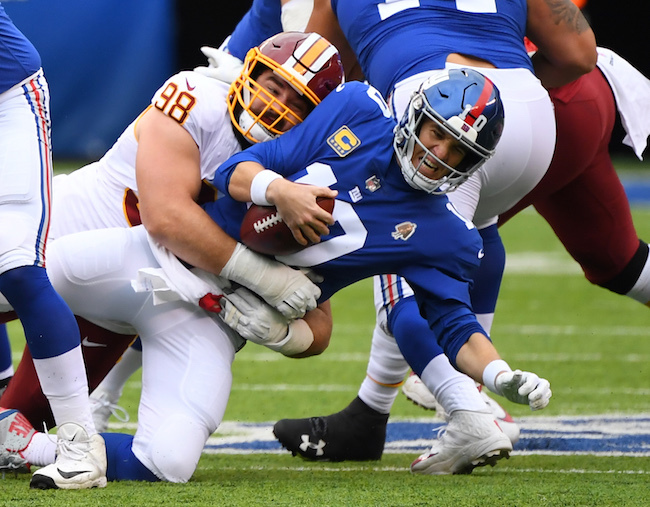 The New York Giants lost yet another game on Sunday, falling 20-13 to the Washington Redskins at MetLife Stadium in East Rutherford, New Jersey. The Giants are now 1-7 overall. The Giants have now failed to score 20 points or more in five of their first eight games. And the Giants’ lone touchdown in the game came with 17 seconds left in the contest. How bad was the New York offense? Not counting the 1-play “possession” right before halftime, the Giants had 11 possessions. Five ended with punts, two with interceptions, and one was a turnover on downs. The Giants only had one drive that picked up more than three first downs. The Giants were 2-of-14 on 3rd down (14 percent). The Giants were held to 37 net yards rushing. Eli Manning was sacked seven times. The offense average 4.9 yards per pass play. The Giants were 1-of-4 in the red zone (25 percent). Most importantly, the team was held to six points until the final seconds of the game. The defense, minus two players traded earlier in the week (Damon Harrison and Eli Apple), as well as starting middle linebacker Alec Ogletree (hamstring), played better. The defense kept the game close into the 4th quarter. But as has been the case most of the year, when the defense needed to make one more stop late in the game, they could not. After the Giants cut the score to 13-6 with just over four minutes to play, running back Adrian Peterson broke off a 64-yard touchdown run to seal the game. Offensively, Eli Manning finished the game 30-of-47 for 316 yards, 1 touchdown, and 2 interceptions. He was sacked seven times. His leading targets were running back Saquon Barkley (9 catches for 73 yards) and wide receiver Odell Beckham (8 catches for 136 yards). Barkley was held to 38 yards on 13 carries. Defensively, the Giants allowed 360 total net yards (182 rushing, 178 passing). 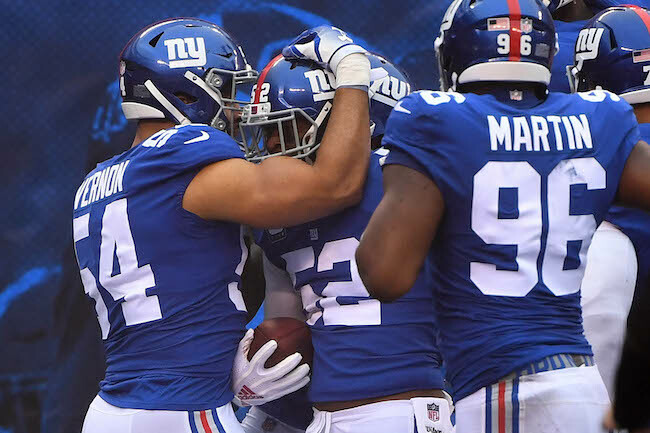 The defense did not accrue a sack or interception, but safety Landon Collins did force a fumble that was recovered and returned 43 yards by linebacker Olivier Vernon. Inactive for the New York Giants were linebacker Alec Ogletree (hamstring), wide receiver Jawill Davis (concussion), quarterback Kyle Lauletta, center Evan Brown, cornerback Mike Jordan, cornerback Tony Lippett, and safety Kamrin Moore. Right tackle Chad Wheeler left the game with an ankle injury and did not return.